Previous version Parallel Space 4.0.8228 apk for Android will help you to downgrade or install older app easily. This is one of the best Tools apps. This application is able to double almost all online applications that require an account, such as social media, messenger, and games. With this feature, you are so much easier to manage two accounts consisting of personal account and an account for work. 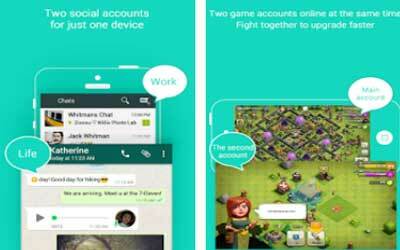 Additionally, play two games in one application accounts simultaneously is also very easy, you can now play two accounts Clash of Clans or other games in a single device. You can also use stealth installation features, applications privacy will be hidden in Parallel Space without a trace in the device. Characteristic of this application is easy to use, stable, functioning, and the application is running based on the first virtualized applications on Android, namely MultiDroid. But keep in mind, Parallel Space would take some memory and RAM capacities, because the application is running major applications virtually. Besides that, the battery capacity will be quickly depleted due to the greater workload. Tested it with WhatsApp and it’s working perfectly. Great work developers! It’s really making chat quicker and faster on two accounts. Enjoying it very much anyways.